Alpinestars has a much greater reputation in motocross and sport riding than they do in the cruiser world. I am not suggesting in any way that their quality is not recognized, but long haul riders tend to be a suspicious and diverse lot. Having a look at the Ridge boots, I was impressed with several convergences that Alpinestars chose to create between cruiser and sport riding footwear. The Ridge is constructed of coated leather. You will have the abrasion resistance of leather, and they are waterproof. There is little worse on a long ride than wet feet, so that's a big plus. These go on quickly with a zipper covered by a velcro flap. From the world of hazard riding, Alpinestars took their cues for protection. The ankle is reinforced with plastic discs, and the heel is injection-molded PU. A polypropylene midsole with rigid shank reinforcement follows the contours of the foot and keeps everything where it ought to be. The toe is protected by layers of leather, so the rider maintains flexibility and feel without being vulnerable. Instead of the rigid plates that you'll find covering the front of motocross boots, the Ridge has padding to protect from impact, but remains light and flexible. 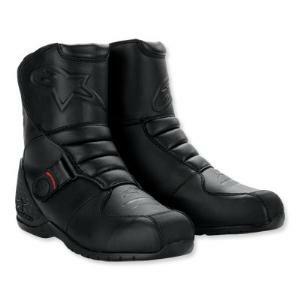 Cruiser riders are often on and off the bike all day, so these were made to wear comfortably in either case. They also bear reflective inserts in the back for visibility on the road. There are a lot of great features on these boots, but they are not a dream come true. To maintain their waterproof nature, they lack adequate ventilation. If you tend to have sweaty feet, you might want to find boots that will wick that moisture away. Or you can settle for a pair of moisture-wicking socks.